Balsam of Peru Essential Oil (Myroxylon balsamum) is also commonly known as Balsamum peruvianim and Black Balsam. Balsam of Peru Essential Oil has a medium‐strength rich, sweet, and balsamic aroma presenting a base fragrance note. We included Balsam of Peru Essential Oil as part of the Rocky Mountain Oils Skin Care collection since the oil is incorporated into many skin care products. Natural perfumes often contain the oil due to its vanilla-like aroma. You’ll also find it as a fragrance component in soaps, detergents, creams and lotions, ointments and cosmetics. Balsam of Peru is suitable for most skin types, soothing the skin and unleashing your natural beauty. Be sure to dilute with a carrier oil before applying topically. The oil also works great for direct inhalation and diffusion. Balsam of Peru may help bolster restful sleep and promotes a comforting effect on the emotions. Combine all ingredients then add to a warm/hot bath and soak for 20 minutes. For additional comfort, dissolve oils in 1 cup Epsom or Sea Salt and add to bath water. In a bowl, mix all ingredients together thoroughly. Store in a small container with a tight lid. To use, dig some out with your finger and scrub mixture on lips in a circular motion. Rinse off. Can be a skin irritant to sensitive skin. Dilute with a carrier oil before topical application. Very thick, but once warmed up,it is easy to work with. I wasn’t sure about the fragrance initially, but the more I smell it, the more it has grown on me. The smell to me is kind of an earthy Vanilla - quite unique. Balsam of Peru lives up to its description. Pleasing vanilla smell will be very nice in body butters and lip balms that I make. Thank you for the education, RMO! 5 stars! This oil smells amazing! I can see why it's so often used in perfumes. The smell is very long lasting and super pleasing. I love it! I love this oil! Smells better than an expensive vanilla candle! Compliments many other oils well too. Will purchase this one again. Yep it is thick and as stated in other comments all companies experience this. Some oils are thicker and don't you want the purest oil possible? That is why I use RMO as they work hard for the best! I am using it in my blends and it does need shaking and I also blend with a carrier oil. This is one of my favorite! It rolls on brown but doesn’t stain, quite thick as advertised. Smells heavenly! One of the best oils! Wonderful warm scent. Takes a bit to get two drops out but warming in pocket helps. Problem is this: label says can diffuse it however once the drop finally reaches the diffuser water, it immediately sinks to bottom. How will that get diffused into the air? Whole point is that the oils float on top of water. I just purchased this for the first time. I was looking for something to replace the CO2 Bourbon Vanilla that I get from another company (who is now out and has no idea when they will get it back in due to the vanilla crisis in Madagascar). OMG! The smell is INCREDIBLE. A good replacement for vanilla and MUCH more cost effective as well. It does have a vanilla-esque smell with a soft undertone of (almost) butter. That's the only way I can describe it properly. My initial thought when I first opened it and tried it was, oh no this is way too thick and I am going to have to return it....and it's black in color! I called RMO to discuss and was assured it will not stain my skin. The drops the fell on my countertop wiped right off, so I do believe her. There are some oils that are just so thick, there is no way an orifice is ever going to work with them, so I am accustomed to taking it off and using a pipette instead. But this stuff is beyond belief THICK, almost close to tar! But the smell, is HEAVEN, so I was determined to find a way to make it work for me. The customer service rep shared that she carries it around in her pocket for while before using. I do not have the patience for that. So I got a double boiler going, set the entire bottle in the dry (top) pan and let the water in the bottom pan boil for about a minute and a half. PROBLEM SOLVED! The consistency is much easier to work with and I was easily able to use a pipette. I have had to soak the pipette in peroxide to get it clean because this stuff is VERY sticky and will not clean off with mere dish soap. So it's a bit of work to use it, but SO worth the effort! I personally will be buying more! If you plan on purchasing this, just be aware of the consistency and be prepared to work a little to use it. The double boiler method worked great for me. As always, I LOVE Rocky Mountain Oils!! Thank you for the holiday sales!! This oil smells wonderful. You can smell a vanilla-esque right off the bat, but then there's this undertone of something I can't quite place, but it's an interesting smell. Like something I should know, but can't place. I tried another poster's suggestion and tucked it in my bra. In less time than it took to write this post, the oil had loosened up quite a bit - and that's after being outside in the cold all day today. Thick regardless of where you buy it. This is a thick oil no matter what company you buy it from. You should not knock the company because of something that is out of their control! If some other company's oil is thin, it's because they diluted it. Smells like a combination of vanilla and cinnamon, and maybe a touch of ylang ylang. Very nice! Great smell. Yes, it is very thick, but it says in the description of the product that it is very thick. It blows my mind that some people will give a product a bad review when the company delivers exactly what is promised but because they couldn't be bothered to read the whole description, they blast it with a bad review. I own a business and this just totally infuriated me. So please read what you are buying before you buy it. That way when you get what you ordered there won't be any surprises. With that being said, it is a really great product from a really great company! it smells divine .. great product, but the thicker ones, like Balsam of Peru, Myrhh and Copaiba .. a few of my favorites, should have a nozzle dropper (like for eye drops), or a glass dropper bottle (one that has a long glass tube into the bottle) so they are easier to extract. I have to take out the plastic dropper top to use these three, for example .. vetiver too, etc .. the thick ones don’t work with the standard top .. It's an awesome oil for so many things.....for all the people leaving negative reviews regarding the thickness/consistency issues, THIS IS HOW PERU BALSAM IS!!!! some brands are easier than others to use from the bottle, however, the frustration doesn't mean you can't still enjoy this oil... you can warm the bottle in a "double boiler" type water bath setting. Use very warm water, (I put bottle inside a baggie first as to not destroy the label) place bottle in top part of double boiler container..for a minute or two and voila!! It should flow from the bottle, drop after drop with no annoying pauses in between.just make sure u don't put it directly into the warm water without putting it in another bowl first, bc as we all know, heat destroys essential oils. I use Balsam of Peru in facial serum, along with some exotic carrier oils and a variety of other EOs, depending on what I feel I need for any given week. I love how it smells on my face! It is a bit thick, but some oils are naturally thicker and/or stickier than others. I love that Rocky Mountain does not dilute or adulterate oils, instead providing nature's gifts in their purest form. I got some micro-pipettes and use tiny rubber bands to hold them to the sides of each bottle, making extraction and measurement of thick and very thin oils much easier. Love the smell,it's a very calming and peaceful scent. Much sweeter than I expected. I don't usually like sweet scents, but this one is really nice. Thick as sap but smells as sweet as can be. I was so impressed with how similar the Balsam of Peru smelled like vanilla. It is absolutely delightfully aromatically but similar to other complaints, thick as sap and more difficult to work with. You won't be able to diffuse it straight out of the bottle as it is so thick. As someone else mentioned, it will just sink to the bottom. I tried to warm a few droplets of it up in a carrier oil but as you can see in the picture, it still ends up "confetti" like after a few good shakes and some of it still collected at the bottom. It still smelled amazing though. I'm a little bummed as diffusing is my preferred method of using essential oils and I don't see it being as effective as I was hoping in a neat blend. I also don't want to warm up the entire bottle each time I want to use it because I imagine that will break down the effectiveness of the oil over time. Any Balsam of Peru experts out there?! smells great, but hard to work with! This was suggested as a replacement for vanilla. It does smell very similar, however, it is SO thick and hard to mix with other oils! I don't know how you can use it in a blend! It just sits on the bottom of the bottle, no matter how much I roll or shake it! naturally some oils are thicker than others. This one is REALLY thick and I don't know how to get it out of the bottle without standing there for 5 minutes for one drip. Will it really disburse well with a carrier oil? Left a residue in the bottom of my diffuser. Having said all of that... I do really like it! I definitely enjoy this aroma outside of the bottle rather than wafting it straight from the bottle. I have read that this oil is excellent for dry skin - I have not yet tried it for that. The scent is nice diffused - it is warming. I will be trying it out as a massage oil on my clients; we'll see what kind of feedback I get and I'll leave another review, if necessary. This oil smells wonderful but it's almost impossible to do anything with, as it's literally sticky tree sap in a bottle. I tried using it to make a reed diffuser. When I was done my fingers and everything involved with making the solution had the black tar-like oil stuck on it. That doesn't wash off. I eventually used rubbing alcohol and Dawn but still had to rub and pick it off. So, if you want to enjoy this oil's lovely smell, be sure to warm it considerably so that it at least thins out. I also found it sitting in a glob at the bottom of my diffuser when I went to refill it. I researched several essential oil companies and had high hopes for Rmo. However the cardamom isn't to my liking and the balsam of Peru has a cheap scent to it. The vetiver is great though. It is very thick. I tried to diffuse it, but it just stayed in a big glop. This one is so thick and gooey. This would never come out of the dropper top. It smells nice, but I don’t know what youbcouldvusebitbfie guvenbits viscosity. Balsam of Peru is horible!!! I was so disappointed in the Balsam of Peru I ordered from RMO. Not only does it smell noxious, it is thick as tar with the same stickiness. I cannot get even one drop to pour out of the bottle. This supposed oil is really more like tree sap that you would get while in the woods and have to remove with paint thinner!!! Unfortunately, this purchase which was my first from RMO has caused me to lose confidence in the quality of this companies products so much so that I will probably not order from them again. I don't understand how a company with a fairly good reputation can sell such inferior product. Don't waste your money on Balsam of Peru from RMO!!!! This oil will not come out of the dripper at all. If you take the dripper off, it will come out in a thick stream, like molasses. I did contact support and was told to let it heat in hand or use other means to get it out. Ridiculous! Disappointed as I think other oils so far have been right on! I was so excited for this oil. It has a wonderful vanilla aroma. Unfortunately it has the consistency of molasses and feels sticky on the skin. First RMO product I will be returning. This would not even come out of the bottle it is so thick..Returned it and waiting for refund 4 days after they recieved it. Sending this back, the scent is ok, but it was sooo thick the oil would not drip out. I opened up the stopper, put a dab on my hand, it was sticky and thicker than honey. I tried to wipe off and it was like trying to get the sticky off from an old piece of tape. I don't know if I just had a bad bottle, but this has to go back. How does this compare to cedarwood? BEST ANSWER: Great question! Balsam of Peru has more of a vanilla scent whereas Cedarwood has a woody aroma to it. Is there a trick to getting it out of the bottle? I have been unable to get a single drop out. 1. These droppers also work best when held horizontally (to the side) instead of vertically (upside down). 4. Take the orifice reducer off of the bottle and use a pipette. What’s the best oil to use with Balsam of Peru to make it thinner? I hope to use it as a scent I wear instead of perfume. BEST ANSWER: Good question! We would suggest mixing it with FCO to help thin out the oil for topical use. How do you get it out of the bottle? It is so thick I can't even get a drop of it out. I've tried warming it with my hand and it isn't budging. 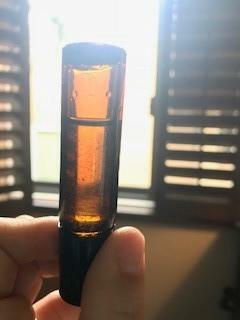 Any suggestions for getting this thick oil out of the bottle? Do you have an oil that smells similar to a Christmas balsam tree? BEST ANSWER: Good question! We would suggest Evergreen Dream, Majestic Breeze, Spruce or Pine.